I love experimenting and trying to come up with new ways of doing things. 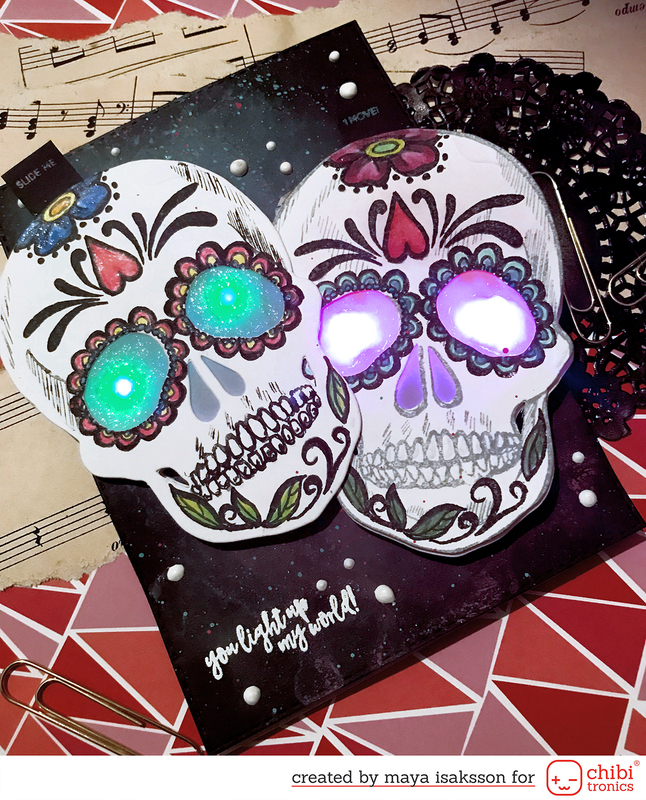 These sugar skulls was an idea that I got and needed to try to make. The idea is that the skulls are attached on sliders and the sliders are also the switch. So you can move the heads up and down making them light up or turn off the light that way. I also added an effect sticker with heartbeat effect because let's face it, effect stickers are super fun! Hop on over to the post at the Chibitronics blog to see a full photo tutorial of how i made this card. If you want to make a card like mine then you will need the following supplies from Chibitronics. The stamps are by Crafters Companion and sentiments from Heffy Doodle stamps.